Summer in Chelan: There are few things like it. The sun shines late into the evening and the air is warm through the night. The glacier-fed lake is crystal-clear blue and the hillsides green and lush. During harvest season, the smell of apples fills the air. 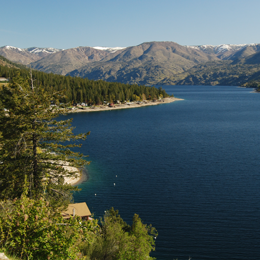 The Lake Chelan Valley has grown in many ways in recent years. You are sure to find something for everyone in this spectacular setting. Wineries have become star attractions in the valley, and Mountainside is located within a short ride of each tasting room. Lake Chelan Winery, Wapato Point Cellars, Benson Vineyards, Tildio Winery, and Balsamroot Winery are all located within one mile of our location. Others including Nefarious Cellars, Karma Kanyon, Tunnel Hill Winery, Vin du Lac, C.R. Sandidge Wines, Chelan Estate Winery, and the spectacular Tuscan-themed Tsillan Cellars are all within a 15 minute drive. There are even wine tours available in the valley including Lakeside Limo and Chelan Valley Tours. Each winery is different and offers its own charm and attraction. Children are welcome in the tasting rooms. Lake Chelan Winery offers a casual daily BBQ which should not be missed. The outdoor dining area with picnic tables and large grass space is ideal for families and groups. Cheers! If golf is your game, there are plenty of ways to spend a week on the links. Lake Chelan Golf is a beautiful municipal course with a challenging track and dramatic views of the lake and mountains. Bear Mountain Ranch has a spectacular course and jaw-dropping views of the lake. If you’d like to venture further, Desert Canyon (ranked #2 in the state by Golf Digest), Alta Lake Golf, and Highlander Golf Club are all within about 60 minutes. What vacation is complete without plenty of fun in the sun and water? A trip to the nearby waterslides will bring the kids home soaked and happy. Slidewaters is just 10 minutes away. Watercraft rentals are also available throughout the valley. You will thank yourself for a day spent cruising towards Stehekin and the North Cascades or fishing on this amazing 55-mile long lake.